The CData Data Providers for QuickBooks Desktop enables you to request almost any report available in QuickBooks Desktop. You can access reports as views, or read-only tables. 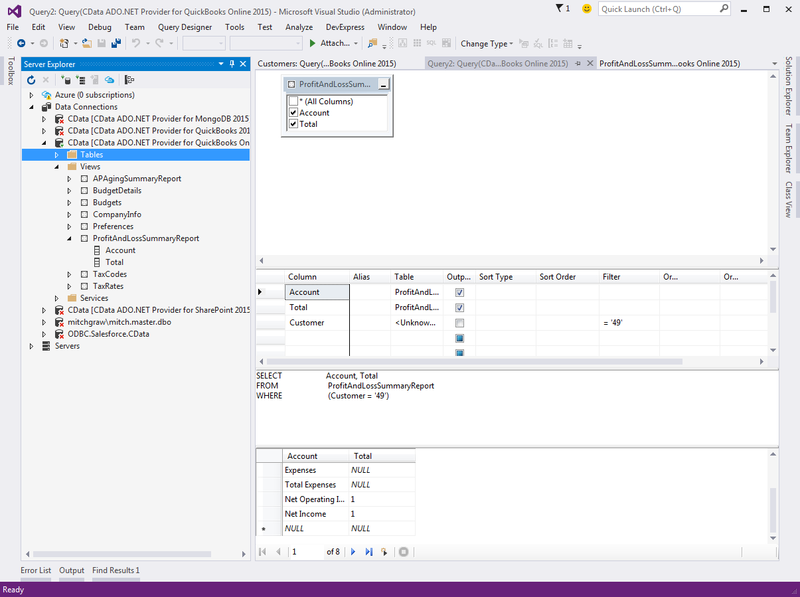 This article shows how to use the ADO.NET provider to execute SQL commands against QuickBooks reports. To execute SELECT queries against reports, you can call the CreateSimpleReportSchema stored procedure to generate the schema, or view definition, for the report. Schemas are simple, XML-based files that are easy to extend. You can avoid regenerating the entire report by modifying report parameters in the schema. You can call the CreateSimpleReportSchema stored procedure to generate the schema for almost any report available in QuickBooks Desktop edition. Before you call the stored procedure, you will first need to set the Location connection property to the location of the table schemas. This is the db subfolder in the installation directory. When you reconnect, the provider will pick up the newly created schema. Schemas are simple, XML-based .rsd files that include column definitions and allowed values.